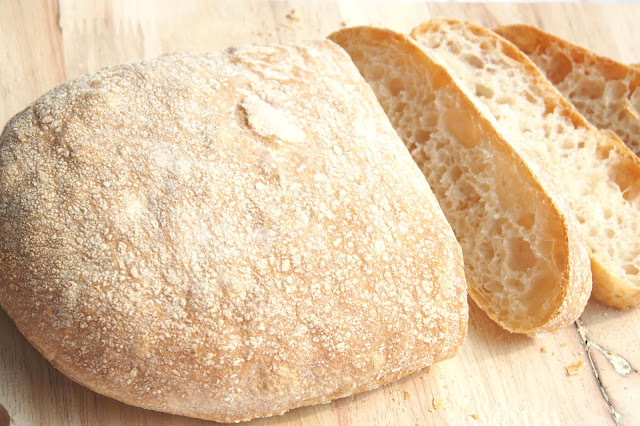 Ciabatta (slipper bread) is an Italian white bread made from wheat flour, water, salt and yeast. It is a flat, shapeless bread with crisp crust and large holes in the interior. This recipe was adapted from The Bread Bible. 1. Six hours or up to 3 days ahead, make the dough starter (biga). 2. In a small bowl combine all the ingredients and stir with wooden spoon for 3 to 5 minutes or until very smooth and comes away from the sides of the bowl. It will be slightly sticky to touch. 3. Cover the bowl tightly with oiled plastic wrap and set aside until tripled and filled with bubbles. 4. This will take 6 hours at room temperature. 1. Mix the dough. In the mixer bowl, whisk together the flour and yeast. Then whisk in the salt (this keeps the yeast from coming in direct contact with the salt, which would kill it). Add water and biga. 2. Knead for 7 mins until the dough pull away from the bowl. If it still doesn’t pull away from the bowl, beat in a little flour 1 teaspoon at a time on low speed. The dough should cling to your fingers if touched. 3. Let the dough rise. 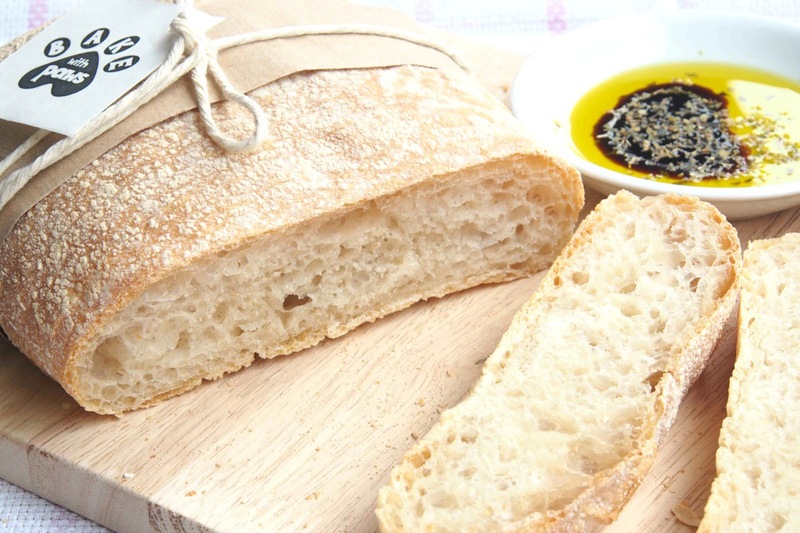 Transfer the dough to a big bowl or food container greased with cooking oil. 4. Cover bowl/container with a lid or plastic wrap. Allow the dough to rise until tripled, 1 ¼ to 2 hours. 5. Shape the dough and let it rise. Line a flat baking pan with non stick baking sheet and dusk with flour. With an oiled spatula, gently scrape the dough onto the baking pan. Using the palms of your hands against the sides of the dough, push it together slightly to create the wrinkle. It will be 10 to 11 inches in length and 4 to 5 inches wide. Dusk with some flour. Allow it to rise a warm spot for another 1 ½ to 2 hours. 6. Preheat the oven. Preheat oven to 240 C or 475 F one hour before baking. Have an oven shelf at the lowest level. 7. Baking the bread. Put the dough on the baking pan in the oven. Toss ½ cup of ice cubes into the pan beneath and immediately shut the door. Bake for 5 minutes. Lower the temperature to 230 C or 450 F and continue baking for 20 minutes or until the bread is deep golden brown. Halfway through baking, turn the pan around for even baking. 8. Cool the bread. Remove the bread from the oven and transfer it to a wire rack to cool completely. 9. Brush off the flour from the surface. 10. 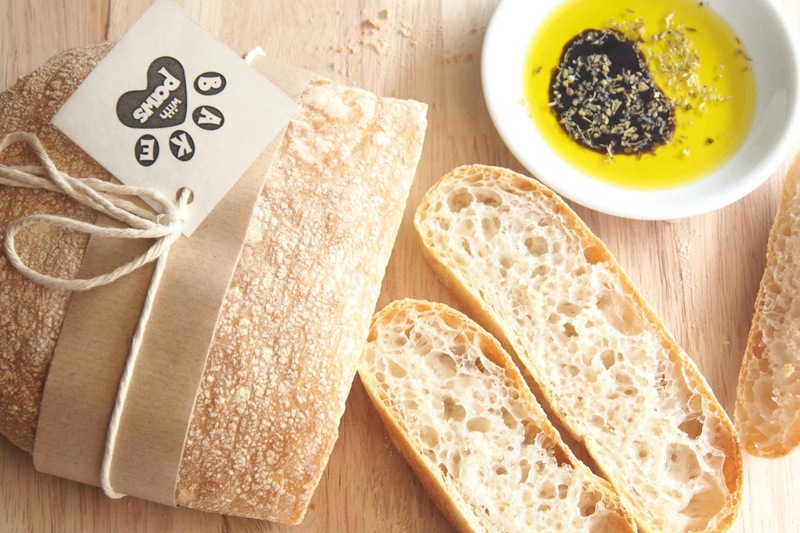 Slice and serve with Extra Virgin Olive Oil and Balsamic Vinegar Dip.